At the moment I’m rocking a bleached blond graduated haircut, and so yesterday I went to my usual salon in West London to get my dark roots bleached. 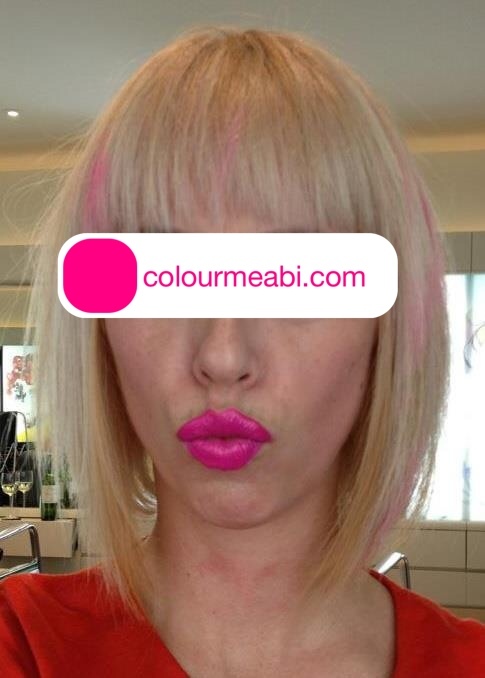 The last time my hair was coloured like this two months earlier (see photo above, featuring pink Kevin Murphy Colorbug chalk streaks), Karen my hairdresser used foils to apply the bleach to my hair, as we were slightly changing the colour. This time round, she applied the very same brand of product directly to my hair (around half a centimetre from my scalp) to lighten my roots. I immediately had a prickling sensation around my neck and hairline, but my scalp itself was fine. I’ve dyed my hair all colours since the age of thirteen (I’m now thirty-five), and I expected this slight reaction. What I didn’t expect was what happened approximately ten to fifteen minutes later: Firstly the skin on my forehead, face and neck became blotchy and swollen, and then my stomach and the palms of my hands followed suit. Retrospectively you can actually see the forewarning of this chemical sensitivity immediately after my previous visit to the hairdresser (pictured at the salon in the photo above), where my skin looks red in patches. This would confirm the suggestion that allergic reactions get worse every time they’re triggered, as yesterday I was in agony: my skin was itchy, I felt like I was burning up yet also felt freezing cold, and was nauseous as hell, not to mention completely out of it: as if I were swimming on a sea of a sicky flu virus, or on a drug trip. I immediately got Karen to wash the bleach off my hair, while the salon junior fetched me some over-the-counter anti-histamines to reduce the itching and swelling. By this point I was struggling to stay focussed and lucid. For ten minutes I sat on the salon loo, with my head situated next to the wash basin so that I could throw up into the sink if necessary. I didn’t vomit, but I sweated profusely whilst feeling freezing cold and itchy all over – I was away with the fairies in allergic-reaction fairyland! I actually have very little memory of what happened next. Suffice to say I was despatched directly to St Charles Hospital’s Out Of Hours service in a taxi. The nurse there immediately sent me to a proper A&E at St Mary’s Paddington, where the assessment GP prescribed me a three day course of steroids and yet more anti-histamines. Previous to this episode, I was aware of dark hair dyes causing reactions with users (generally due to an ingredient called Paraphenylenediamine or PPD, which is renowned for its allergenic properties but is used in the industry as a standard ingredient in permanent hair dye – especially those hair dyes at the darker end of the spectrum), but I had never heard of this happening with bleach – especially since I’d used the exact same product only two months before! Upon googling adverse reactions to dying and bleaching hair, it seems that it is possible to suddenly react badly to an ingredient in hair-dye which has previously been used without any issues. From what I’ve read, I understand that it is essential to seek medical help if you too experience any of the allergic reactions I had, as the reactions can become even worse and anaphylactic, because your breathing can be compromised if your throat also swells up. So since this didn’t happen to me, it looks like I was actually kinda lucky! After this, apparently the most important thing to consider is that with each subsequent application of the same product (or product with similar ingredients), the allergic reaction increases in severity. Using foils instead of direct scalp application is unlikely to reduce a reaction, as the dye will still leak towards the skin. Which I’m guessing rules out bleach for me in the future – and possibly other dyes too! In two months time my shoulder-length platinum hair will have dark roots, and if hair-dye/ bleaching is ruled out, I am quite frankly at a loss as to what to do with my hair next time I visit the hairdressers. In addition, I have yet to put any toner on my hair, so it’s now an attractive shade of brassy blonde! But that’s the least of my worries. For now, I can rest safe in the knowledge that yesterday I had a lucky escape. And tomorrow? Who knows. NB: Well, actually I do know, as a year and a half has passed since this piece was first posted. Hair-colouring update incoming!